Sell your junk car fast with DamagedCars.com. Getting an instant offer for a damaged car is easy. See how much your car is worth now by entering your zip code below. Selling a car in Washington, just like selling a car anywhere can be a bit of a pain. The question of how to sell a car in Washington has answers that vary with the type of car you’re trying to sell. The first step is finding out how much your car is worth. For that you should take a look at similar cars that are for sale and see what they are going for. You can also click the button below to find out how much your car is worth. DamagedCars.com has a network of junkyards in Washington we work with to get you the best price for your junk car! We only work with top salvage yards around you, so you get free towing in 24-48 hours. Our offers are guaranteed, and based on fair market values. See how much your junk car is worth in Washington right now. 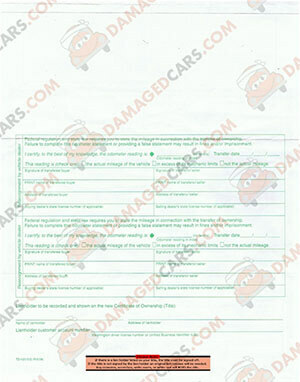 Next, take a look at the condition of your car. Is it like new? If that’s the case, taking your car into a dealership will get you the fastest money for your car. But, it won’t get you the most money. For that, you’ll need to sell the car yourself. There are a number of ways to do that,but all of those options can take quite a while and have their own cons. If your car is in less-than-perfect condition or has a salvage title, you’ve come to the right site. DamagedCars.com specializes in buying wrecked, broken-down and salvage cars. Click on the “Get an Offer” button to get your guaranteed, no-obligation offer, fast. Like many other environmentally-focused states with a population split between urban centers and rural areas, Washington requires emissions inspections only of vehicles registered in certain zip codes within much of Clark, King, Pierce, Snohomish and Spokane counties. 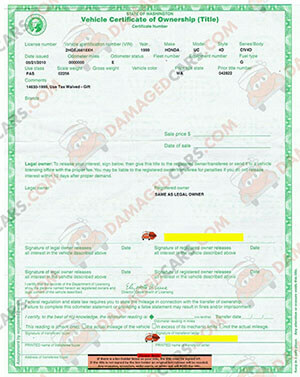 The frequency with which vehicles need to be tested depends on the model year and the year the registration expires. The Washington title has two locations that require a signature. Both locations are on the front of the title. The first location in in the center of the title on the right side. This location is marked "SIGNATURE OF REGISTERED OWNER". There is also a place for a second owner immediately below the first owners signature. The second signature location is also on the front of the title, on the lower right side. The second location is marked "SIGNATURE OF TRANSFEROR/SELLER”. In Washington, the seller’s name must match the name of the owner on the front of the title. If not, don’t sign. Verify you are signing correctly before you sign the title. Incorrect signatures, signatures in the wrong locations, erasures and mark outs may void the title. How can I get a To Sell a junk car in Washington instantly? No.The Washington State Department of Licensing requires a title to sell a vehicle. So when you are considering trying to get cash for cars in Washington state have the title on hand. Selling a car in Washington state is easy with DamagedCars.com. We help you with title transfer, offer free towing from your location, and pay you on the spot! It takes less than 90 seconds to get your guaranteed offer, and we tow your car in 24-48 hours. We buy junk cars every day, so we can give you the fair market value of your junk vehicle. All our junk car removal services in Washington are completely free! On top of that, you'll get paid top prices for your junk car. And scheduling a free junk car removal in Washington is easy. All you have to is enter some vehicle information to our junk car value calculator and get your offer online! See how much your junk car is worth today.